EA is bringing a new game to Xbox Live and PlayStation Network that will fill in the gaps between Dead Space and Dead Space 2. Fans of Dead Space have something new to look forward to before next year's release of Dead Space 2. EA has revealed that a new game set in the Dead Space universe — Dead Space Ignition — will be coming to Xbox Live and PSN in a few months. Dead Space Ignition is planned to bridge the stories of Dead Space and Dead Space 2. 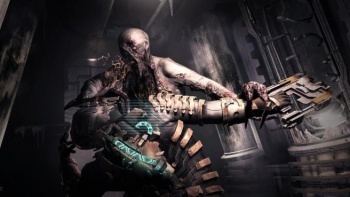 At the start of Dead Space 2, Isaac Clarke is still alive after the first game's cliffhanger, although he's surrounded by Necromorphs and has no idea how he wound up there. Ignition, in turn, will explain what happened prior to this. Ignition will feature a "comic-style" storyline and include hacking minigames. According to EA, these minigames are a, "fun and satisfying arcade experience that will challenge players with puzzles and twitch gameplay." There are going to be four different endings, and completing the game will unlock exclusive items in Dead Space 2 (including a special suit of armor). Exactly what EA means by "comic-style" plot isn't really certain, but the game's script was written by Antony Johnston, who has penned both popular novels and comic series. Dead Space Ignition has been announced for this Fall, well before Dead Space 2's January launch, but nothing more specific has been revealed. No price for the game has been revealed, either. Personally, I'm not sure about the hacking minigames, but as long as the game is more enjoyable than Dead Space: Downfall I'll consider it a win.